The 3 greatest chronicles of my visit to India are the monumental Taj Mahal (one that you can see on my Facebook profile pic) that enthralled my sight, the deep-rooted cultural differences within a single country that moved my heart and finally the lip-smacking Samosas (the most popular Indian snack) pairing its pride with the mouthwatering mint chutney that are still deeply vested within my taste buds. Power-packed with immeasurable health benefits, mint leaves botanically known as Mentha arvensis has a distinct aroma that’ll uplift you instantly. 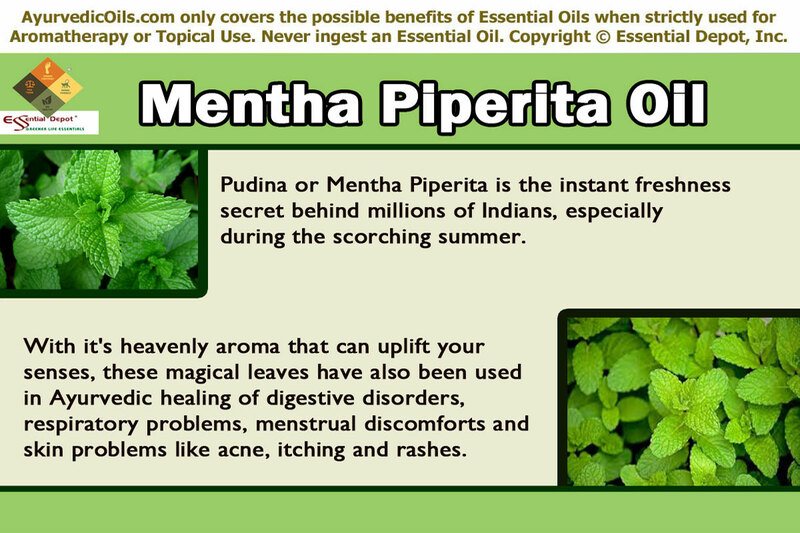 Mentha oil or Mentha Piperita oil is extracted from the leaves of this plant by steam distillation. Known as Pudina or Podina, the fresh and dried leaves along with its essential oil have been in use in Ayurveda, the oldest of all healing sciences for more than thousands of years. The most popular Ayurvedic uses of this herb are for treating digestive disorders, respiratory problems, menstrual discomforts and skin problems like acne, itching and rashes. The history of Mentha piperita dates back to 3,000 years and is still trusted to be cultivated first in the temperate climate of Europe, after which it was slowly spread to Asian countries like India, Japan and China along with certain other countries in Africa and North America. Currently India is the largest producer and exporter of Mentha oil contributing to 80% of the world’s total production. Among many other members of the mint family Lamiaceae, Mentha arvensis is the only member that thrives well in subtropical areas. It is also known to the world with other names like Japanese mint, Corn mint, Wild mint, Field mint and Pudina. This herb was used by the Aztecs to promote perspiration, treat stomach pain, flatulence and colic. Mentha oil was also used in treating pain, headache and oral problems. The herbal infusion prepared with these leaves was really effective in treating insomnia and sleeping disorders. Mentha Arvensis was also used by the Native Americans for treating pain, inflammation and stomach ache. The traditional Europeans used mint as a remedy for cough, gastrointestinal disorders, flatulence and gall bladder problems. There are numerous home remedies using fresh mint leaves. The Ojibwa community uses this plant in sweat-bath, whereas it is a part of the Sun Dance ceremony of the Northern Cheyenne Indians of Montana. This medicinal plant is also a part of Ayurveda, TCM (Traditional Chinese Medicine) and various other contemporary healing methodologies. This oil consists of about 95% menthol and other active ingredients are isomenthone, methyl acetate, menthone, alpha-pinene, camphene, beta-pinene, piperitone, flavonoids, limonene, beta-caryopyllene, neomenthol and tannins. The healing properties are carminative, antispasmodic, antiseptic, antimicrobial, cholagogue, anti-fungal, expectorant, stimulant, tonic, antiphlogistic, antidepressant and nervine. Pudina is an incredible kitchen herb in India and many other Asian countries for its tempting and refreshing aroma along with its excellent medicinal values. Ayurveda aged for about 5000 years is a holistic medicinal practice that considers every human being as a part of nature. Ill-health and good health according to Ayurvedic texts depend upon nature and natural remedies are the best way to treat it. Based upon this principle, Ayurvedic remedies encompass nature’s gifts like herbs and essential oils along with a balanced lifestyle, yoga, meditation and simple physical exercises that can assist in preventing diseases and pave way for longevity. Every human being is considered as a unique creation and just like Hippocrates words ‘One man’s food is another man’s poison’, Ayurvedic treatments differ from individual to individual even for the same disease. This uniqueness is identified by one’s individual constitution that is made up of three bio-energies known as doshas. They are vata, kapha and pitta doshas. Perfect balance between all the three doshas with the predominance of any one of the dosha determines a human’s health, attributes along with his physical and mental set up. Imbalance of doshas end up in illness and Ayurvedic treatments often prescribe remedies that can stabilize dosha disparities. Mentha and its essential oil are said to pacify pitta and kapha doshas and aggravate vata dosha with its easy, clear, dry and light properties. Mentha arvensis is a natural carminative that speeds up sluggish digestion, treats indigestion, motion sickness, flatulence, colic, dyspepsia, food poisoning, nausea, intestinal peristalsis and gas. The active ingredients present in Menthol essential oil pacifies the inner lining of the stomach and intestines and its cooling property aids in treating ulcers as well. The stomachic and digestion promoting properties of mint has made it a vital ingredient in many lamb and other meat dishes in the Middle East, America, Great Britain, Asia and Africa. Ancient people also used mint for preventing coagulation of milk. All you need to do to treat your digestive chaos is to add 3 to 4 drops of Mentha piperita oil in warm bathing water and let that warmth and refreshing energy of the medicated bathing water treat your digestive difficulties. You can also gently massage your abdomen and tummy with 2 drops of this oil blended with sesame oil for assisting your digestive problems. The simplest way to treat nausea (especially while traveling), morning sickness and loss of appetite is to add 1 drop of Mentha oil to your hanky or tissue and inhale its invigorating aroma that can put an end to your giddiness and nostalgic feeling just like that. Inhaling the healing aroma of Mentha oil by adding 2 drops to steam inhalation assists in treating respiratory problems like cold, asthma, bronchitis, sinus congestion, blocked nasal passages and congestion of lungs and bronchi. Adding 2 drops of this oil to your cold rub and gently rubbing it on your chest, throat, back and forehead can aid in relieving headache, sore throat, chest congestion and runny nose. This speedy action is due to the presence of menthol, which is a primary ingredient in all the popular vaporub and balms in the market. The febrifuge and diaphoretic properties of Mentha essential oil helps in reducing fever by releasing the heat of the body through sweat. The antimicrobial and antifungal properties of this oil assist in curbing the growth of harmful microbes causing fever and other respiratory infections. 2 drops of Mentha oil can be added with coconut oil and applied on the soles of your feet to reduce your body temperature and treat neuralgia as the vital points of all the parts of your body are connected to the soles. The power to emancipate all types of stagnations in the body makes Mentha essential oil as a promising remedy for treating menstrual pain and blocked menstruation. Massaging your lower abdomen with 2 to 3 drops of Mentha oil along with sesame oil helps in regularizing your menstrual cycle, treat dysmennorhea, nausea and other painful symptoms of menstruation by balancing the level of estrogen. Undoubtedly, Mentha essential oil is a natural antiseptic that aids in healing wounds and treating numerous skin problems. It acts as a protective shield on the skin and guards against the infections of micro organisms like bacteria, fungi and other microbes. A 2008 study on ‘Enhancement of the Antibiotic activity against a Multiresistant Escherichia coli by Mentha Arvensis L. and Chlorpromazine’ has proved that the extracts of Mentha Arvensis can be used as natural weapon for bacterial resistance. This oil has excellent skin cleansing properties. Adding 2 drops of Mentha oil to your skin care cream or lotion supports in treating pimples, blackheads, blemishes and dark circles. This oil also has anti-pruritic effect that can be effective in treating itching, rashes and insect bites. The rich menthol content in Mentha piperita oil helps in relaxing the muscles, treat muscular spasms, reduce pain, alleviate inflammation and promote blood circulation. Massaging the affected area with 2 drops of Mentha oil blended with coconut oil can aid in relieving pain, rheumatism, arthritis, numbness, soreness and irritation. No one can deny the fact that mint has an enlivening aroma that can drive us straight to a whole new world of freshness and fragrance. Inhaling the aroma of Mentha oil by adding 2 drops to your aromatic lamp or diffuser or air freshener can trim down your fatigue, stress, depression, nervous tension and anxiety after a long tiring day. The aromatic molecules of this tranquilizing oil travel through your nasal passages and reach the limbic system of the brain, which is the body’s control hub of feelings and emotions. By this way Mentha oil motivates, pacifies, rejuvenates and replenishes your senses and augments your mental power by boosting your confidence. Mentha piperita essential oil is also used in lotions, toothpastes, gargles, cough drops, analgesic balms, perfumery, pharmaceuticals, mouth fresheners, shampoos, tobacco products and as a flavoring agent in numerous other products. You can also use this oil as a natural oral cleanser by adding 1 drop of Mentha oil to a cup of warm water and use it as a gargle in the morning and at night. This assists in killing germs, restricting bacterial growth, refreshing your breath, strengthening your gums and whitening your teeth. This article is only for educational purposes and is not meant to treat or diagnose any health condition or to substitute any prescribed medications or expert professional advice. We are not healthcare professionals and this information is shared with the idea of spreading the significance of Ayurveda, the oldest holistic healing system on earth. Never use essential oils internally. Ensure that you dilute them in appropriate carrier oils before using it for external purposes as pure and organic essential oils are extremely concentrated liquids and undiluted use on the skin might cause allergic reactions. It is highly recommended to speak with your Ayurvedic expert/ healthcare professional prior to choosing the appropriate essential oils for your unique individual constitution and state of health. 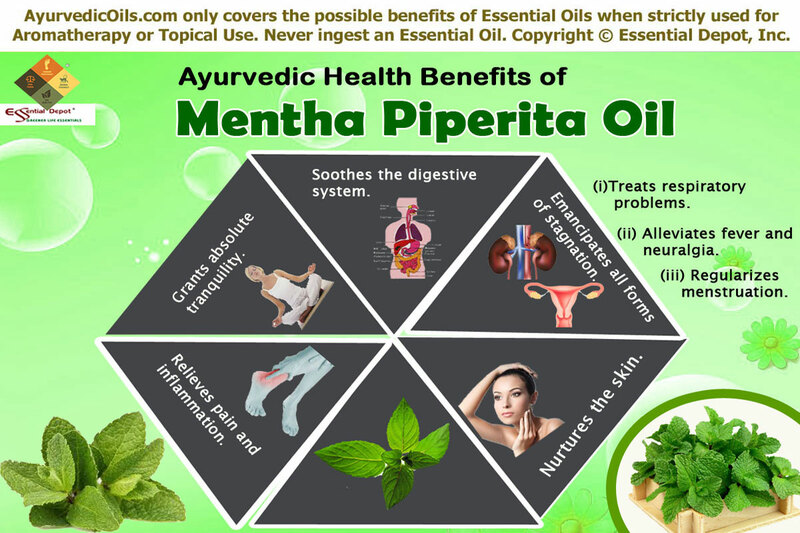 This entry was posted in Essential Oils - Learn About and Purchase and tagged Ayurvedic health benefits of Mentha oil, Ayurvedic oils for blocked menstruation, Ayurvedic oils for depression, Ayurvedic oils for digestive problems, Ayurvedic oils for pain, Ayurvedic oils for respiratory infections, Ayurvedic oils for skin problems, Ayurvedic remedies for acne, Ayurvedic remedies for fever, Ayurvedic remedies for tension, Chemical constituents of Metha piperita oil, culinary herbs, Health benefits of Mentha essential oil, Helath benefits of Mentha Piperita oil, Mentha Arvensis, Mentha Arvensis in Ayurveda, Mentha oil, Mint uses in Ayurveda, Oils for menstrual pain, Oils for rheumatism, Therapeutic properties of Mentha piperita oil by AyurvedicOils. Bookmark the permalink.